U.S. 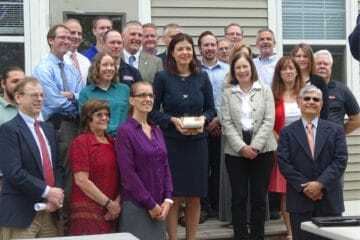 Senator Kelly Ayotte (R-N.H.) visited and toured Nobis Engineering in its Concord, New Hampshire headquarters on June 5, 2015. Nobis is a NH-based business that provides environmental, civil, and geotechnical engineering services to federal, state, municipal, and commercial clients throughout the Northeast. During her visit, Senator Ayotte met with Nobis’ employee-owners about the firm’s services; learned of its Employee Stock Ownership Plan (ESOP) which provides the company’s workforce with an ownership interest in the firm; and fielded questions during a Question and Answer (Q&A) session. Q&A topics ranged from future funding for Brownfields, municipal water supply, and transportation projects to national security and identity theft concerns. A native of New Hampshire, Senator Ayotte is a former NH Attorney General and has served as NH’s Senator since 2011. Senator Ayotte serves on the Armed Services; Budget; Commerce, Science, and Transportation; Homeland Security and Governmental Affairs; and Small Business and Entrepreneurship Committees in the 113th U.S. Congress.